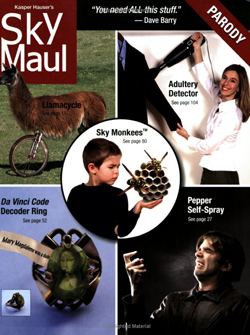 We don't usually pimp books here on Gizmodo, but since our readers are intimately aware of both the SkyMall catalogue and parody magazines, we thought the SkyMaul book would be right up your alley. The book: a fake catalogue of ridiculous crap—including gadgets—designed to both mock and pay homage to the real SkyMall. After all, what're you going to read on your flight? Southwest's Spirit Magazine? No thanks.